I used this wonderful Whimsy Stamp called Into The Farm for my card. 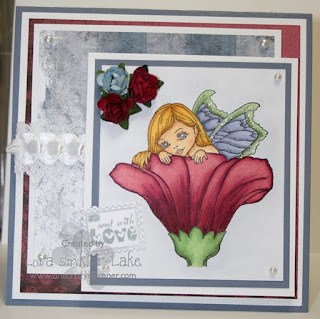 I love the Echo Designs from Whimsy Stamps, especially the vintage ones. I only used part of this stamp and the rest of it is, just as wonderful as this part. I love anytime I can add a masculine or neutral card to my stack cause it seems that I NEVER have a boy card when I need one. Just a reminder, you have another day or two to enter our "Winter/Christmas" themed challenge for a chance to win a fabulous prize!!! Today was not a good day weather-wise to drive home, so I’m finding myself about 400 km from home separated by bad weather over the pass. 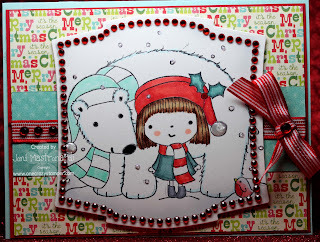 I have a very quick post for today using anoher one of my favorite Magn olia images called Tilda with Christmas Snow Heart, available at one Crazy Stamper.com. 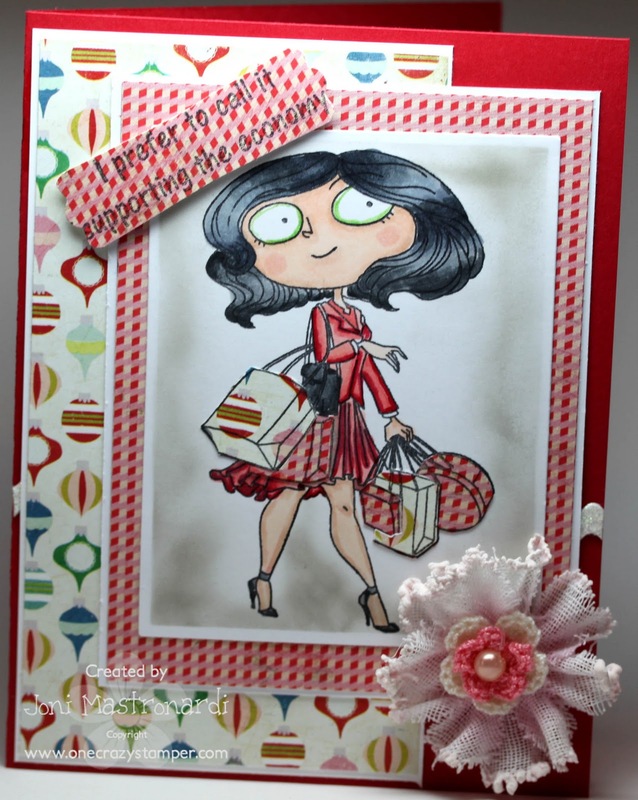 Supplies used: White Xpress it, Tuxedo Black Memento ink; Copic markers; Spellbinders Lacey Ovals; Bo Bunny DP, Cherry Cobbler Ribbon and Cardstock. This front was made into a card box with a hidden surprize of chocolate bar and cash. (see previous post)…. Looks Like Another Christmas Card!!! I know this looks like yet another Christmas card, but I think this cute little fairy elf is having a long deserved nap, after getting through another busy holiday season!! It's time again, to show you my card for One Crazy Stamper's Winter/Christmas theme challenge this month. The image is from Whimsy Stamps Crissy Armstrong's stamp collection, and is called "Christmas Dreaming". It was stamped with Versa Fine Onyx Black ink onto watercolor paper, then painted with Distress Ink re-inkers and a Pentel Aquash Water brush. The wings were covered with clear glue and Glitter Ritz Cool Highlight micro fine glitter. After fussy cutting the image, I popped it up with EK Success 3D Foam dots, and adhered it to the embossed piece of cardstock. MME's Lime Twist twine was wrapped around this layer, and two tags with a handwritten message finish the card front. 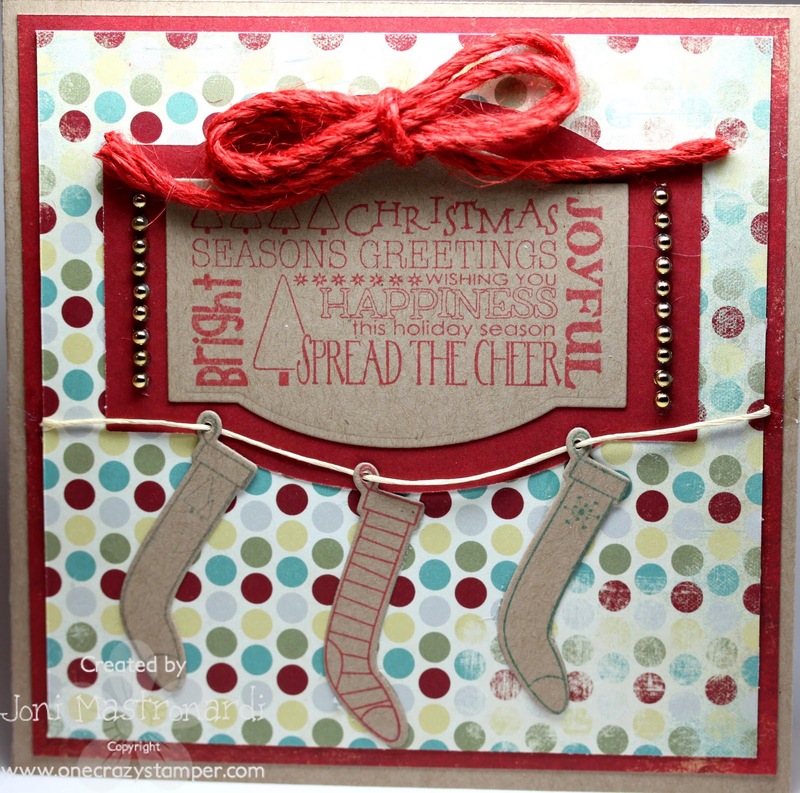 You still have a few days to enter the One Crazy Stamper December challenge to win a great prize. Santa has finally arrived and presents have been opened. 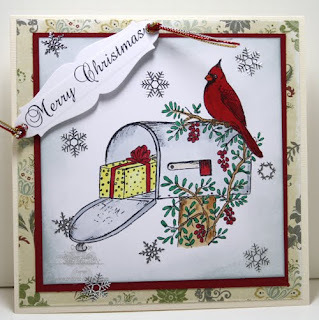 For my Christmas post today for One Crazy Stamper I have used the Cardinal Holiday Mailbox stamp from Heartfelt Creations. 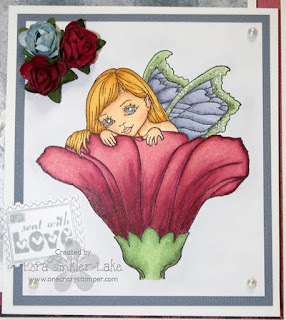 There is still time to get in on this month's challenge to win the great Our Craft Lounge stamp set. Can you believe Christmas is already here!?!? I swear it was just summer and we are already a week away from 2012. I hope everyone is finding some time to get crafty during all of the holiday rush! For today's card I slid in one more Christmas card for the season! I love these a la modes stamps from My Favorite Things. They are so easy to stamp (a crisp, clean impression on the first try!) and super fun to color and the images have bold lines which makes it easy to paper piece (I did that to the bear). I also used some of the fun Lime Twist Twine! The paper is from My Minds Eye! Hope you all have a wonderful holiday and see you in the new year! 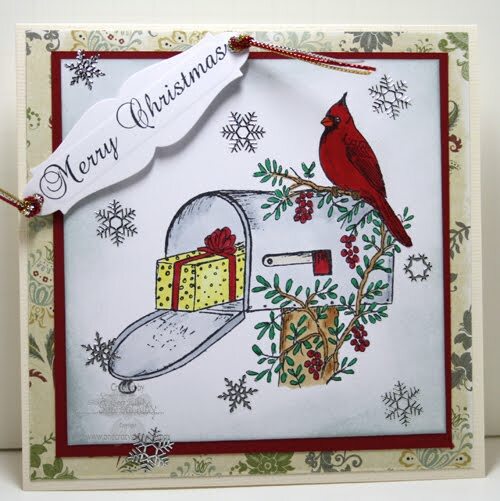 I just got to play with this new Happy Holidays stamp and die set from Your Next Stamp available at One Crazy Stamper. It is so much fun to use. First you make a template from the dies. then you stamp your images. Line up your template over your stamped images and trace the circles. Now all you have to do is line up the die with the traced circles and you have perfectly cut images every time with the coordinating dies. Today I have a lovely image from Whimsy for you called Fairy Dreams. Everytime I look at this image I smile because it looks so innocent and precious! Wishing all of you a happy holiday season! Hi all, Madge here for another Wonderful Wednesday! Are you all ready for that Magical Day of the Year?? I’m not . . . . but still have a day before we leave for the holidays. . . . . . DH says, we have to make a break for it when the weather is good! The pass that we go over is quite bad in the winter – and storms come in at the drop of a hat. I’m so enchanted with Magnolia Stamps and so I’ve chosen to showcase one of the Christmas Darling’s called “Tilda with Cross-stitched heart”. She is just so sweet, sitting with her lantern in the snow. I stamped the image onto Copic Xpress-It Blend C/S with Memento Tuxedo Black ink and colored her wi th Copic Markers. Cut her out, added 3D tape and plunked her cute little bottom onto a strip of rolled wide Seam Binding to keep her warm…….. lol. 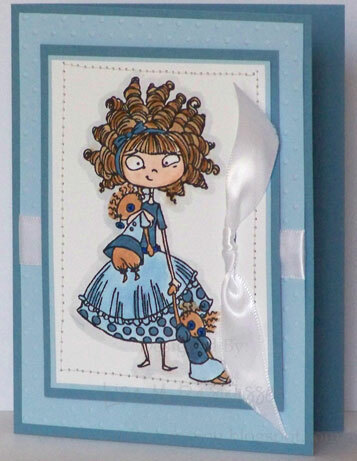 I then added a bow to add some dimension and Stickles on her Heart X Stitch, and accents on the papers. I also sponged the papers with Tim Holtz Tea Dye Distress Ink. The papers I used are from the 25 Days of Christmas Collection available at OCS. Love the vintage look. Now for the inside......... I have made this a box card with treats hidden behind a removable acetate sleeve with a sentiment on it. I wish you all, a Very Blessed and safe Merry Christmas. May you spend time with family and loved ones. For a little extra Holiday Magic go to the One Crazy Stamper Blog, there is still time to enter. 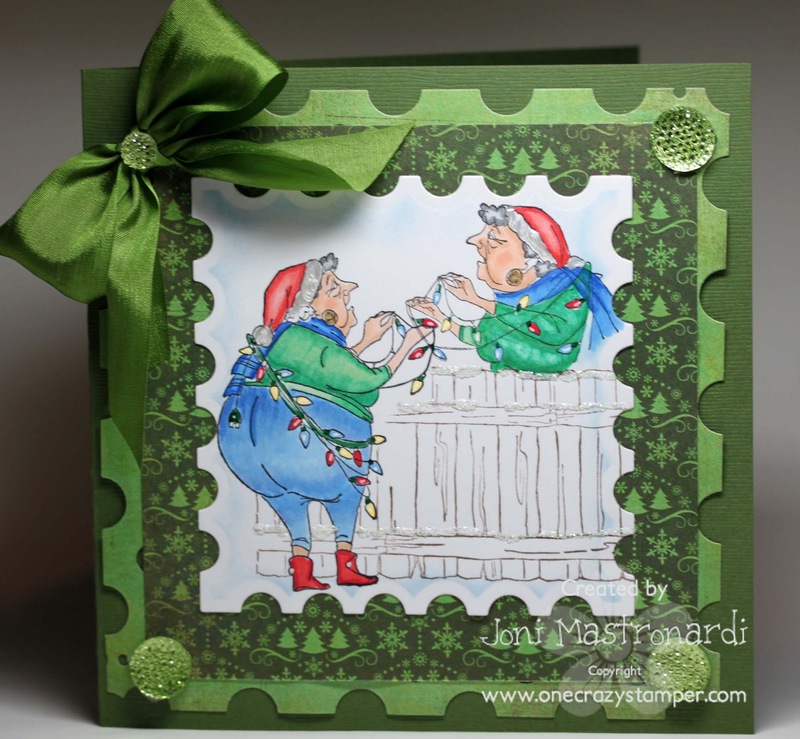 Welcome to another Tuesday at One Crazy Stamper and my card for this months challenge theme of Winter/Christmas. I was so happy when Lora started carrying the Impression Obsession Stamps at OCS as the detail in these stamps is absolutely amazing, and this image is no exception. This is Santa's Bridge which I stamped on watercolor paper with Versa Fine Onyx Black ink, and then colored using a Pental Aquash Water Brush and several colors of Tim Holtz's Distress Re-inkers. You can use your Tim Holtz Distress Ink pads for this technique as well, by just pushing down on the center of the lid of your ink pad, and then using the droplets of color on the inside of the lid. I have always used a palette that I created out of a list of the 36 colors of distress inks and a sheet of acrylic, and I have now added the new Tim Holtz Ink Palette to my collection, and I love the fact that you can just close the lid and save your colors for the next project ( see photo below ). Wishing you all a very Merry Christmas and all the best in the New Year!!! Don't forget to enter the challenge for your chance to win! Today I'm sharing a card for One Crazy Stamper using Kraftin Kimmie's Sharing is Loving set! She is such an adorable little cute...her long legs remind me of my daughter's! 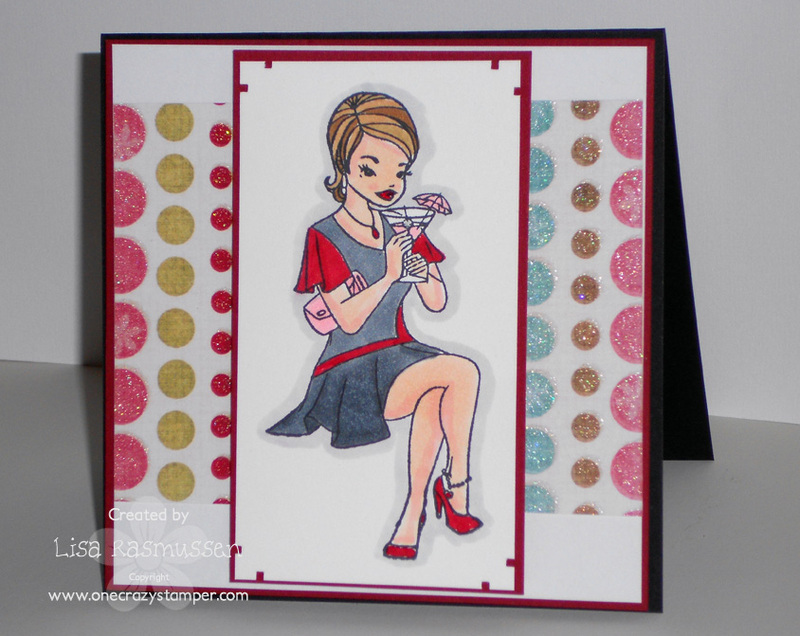 I embellished my card with rhinestones and colored my image with the Copic markers pictured below. You will want to stop by the site and check out the Winter Clearance Event! It's time for our Winter Clearance Event!!! Save up to 60% off hundreds of products in the Winter Clearance & regular Clearance sections. Shop often as we will continue to add products to the sale!! There will be no backorders on any products, savings only while quantities last. We have added a ton of items to the Clearance section as well...when they are gone they are gone!!! 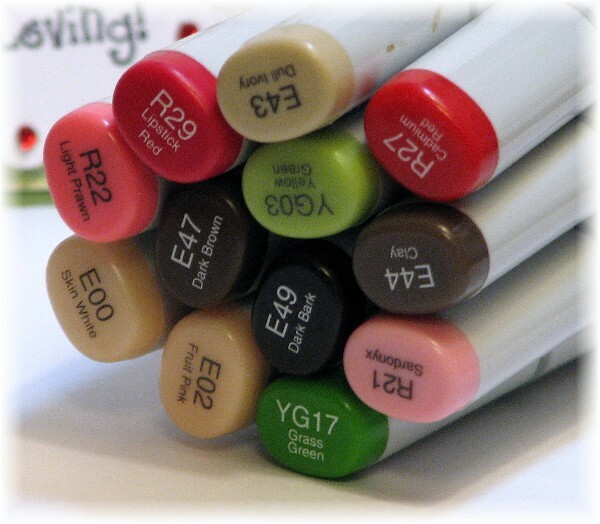 *Copic Large Carry Bag - $87.96 each!! 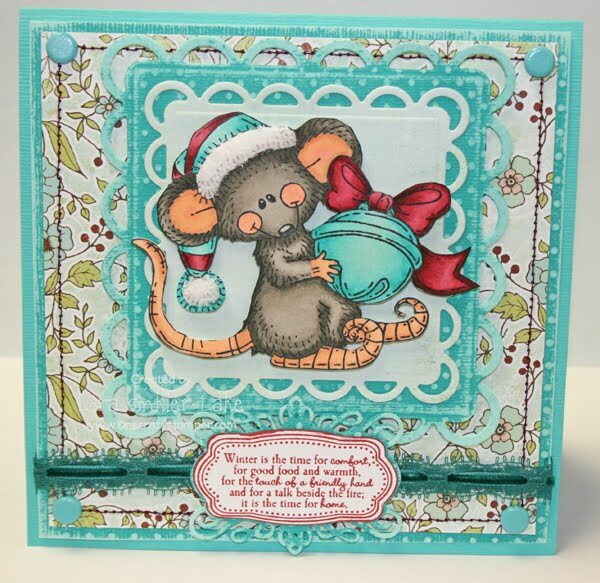 It's Sue here and for my post today I have used this cute stamp designed by Penny Johnson for Stampavie called Stocking Fillers that can be found at OCS. There is still time to join in our Christmas/Holiday Challenge for a chance to win a stamp set from One Crazy Stamper. Don't forget to see the amazing Winter Blow Out Sale that is now going on at OCS. Hi all! wow things have been insanely busy here! Hope you guys are able to take a moment and breathe. Another quick and simple card for you guys! I love having these cards on hand for birthdays and thank you cards because I always need those. 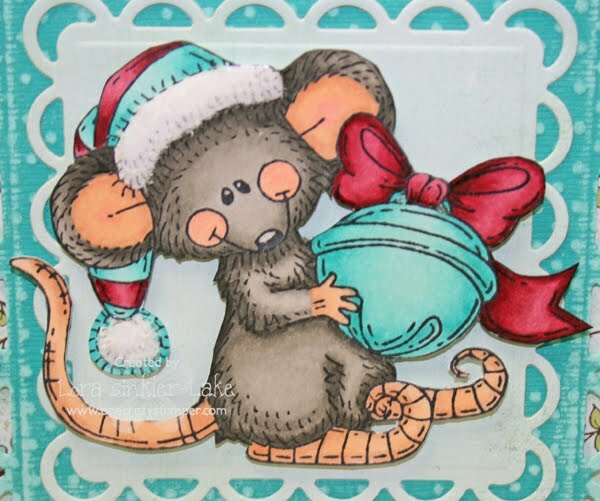 This is one of my ALL TIME favorite stamps by Kraftin Kimmie! Charlotte. I was able to break out my sewing machine which I hope to have more accessable for future projects! I love what the little bit of sewing does to a project! Hope you guys have a wonderful crafty week and see you next week! 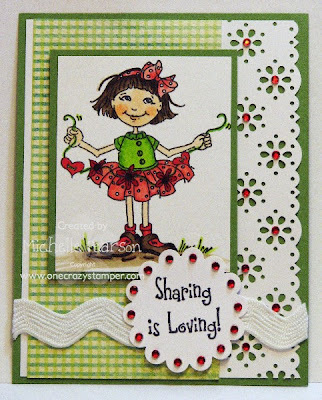 For today's card I have this adorable stamp from Art Impressions available at One Crazy Stamper! I stamped my image with Memento black ink. The fence is also from Art Impressions and that was stamped with Memento brown ink. 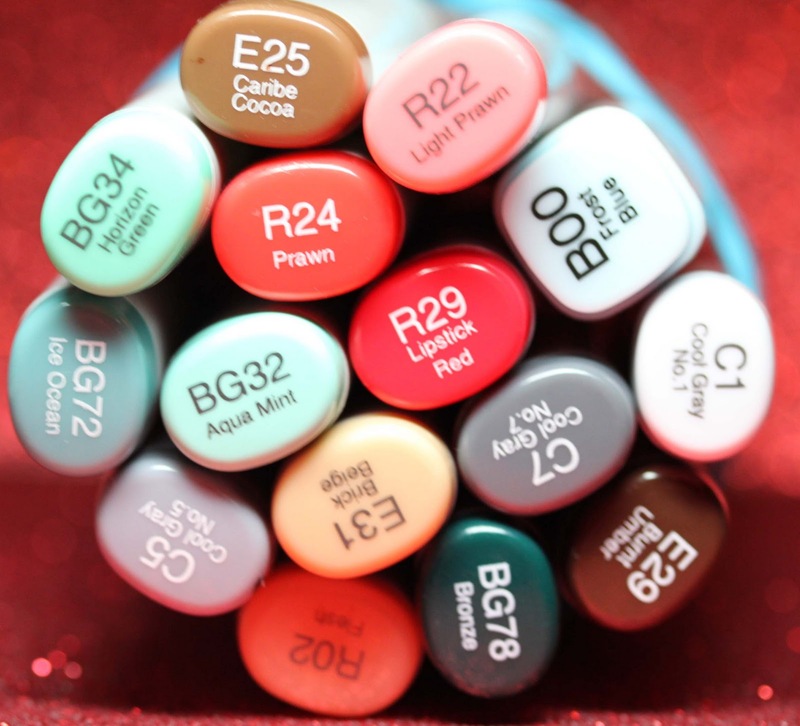 I colored my lady with the following copics: R22, R24, R29, G24, G29 and B21, B24. I cut out the image using a Spellbinders die. DP is Basic Grey Nordic Holiday. A green silk bow tops off the card. Remember there is still time to join in our Christmas Challenge for a chance to win a stamp set from One Crazy Stamper. See the blog for more details! They are “smooching” birdies, because in my hurry to add “smooch”, I dropped a hair laden with smooch onto the top of my paper…..which led to me taking a layer of paper off to remove the color…..so then I added some TH distress ink (stormy sky) and topped it with some white StazOn. So my birdies are enduring “stormy” weather. What did we ever do without “Smooch”, Glaze On, Stickles, - they make adding glitz and glitter to a card so easy….What did we ever do without Copic Markers?? I colored this image a while back using Xpress It white, Memento Tuxedo Black ink and for the few times I actually matched the copics to the paper (from stash) I chose. . . . . . . . . and here is the inside . . . . . . . . . . . . . I used a Hero Arts Clear stamp and colored it with copics and stickles. Thank you for taking your busy time of the year to take a peek. May all of you have a safe and blessed Christmas with your loved ones. Are they called a Herd? I'm not sure if a group of reindeer are called a herd or not, but here's my interpretation of three of Santa's special friends getting ready for the big day, and my card for this month's challenge theme of Winter/Christmas. Your Next Stamp has adorable images and this is Happy as a Reindeer, stamped and masked on Copic Xpress It paper with Memento Tuxedo Black ink, and colored with Copics. The colored image and the red mat were both torn and inked, then mounted on designer paper from Fancy Pants Saint Nick collection. The reindeers harnesses and the red stripes were all highlighted with the Chrome Silver Pearl Pen from Viva Decor, and textured snow was added with White Liquid Applique. Tee, hee! Today's card just makes me grin! The image is called Ready, Set, DUCK! and is by Whimsy. 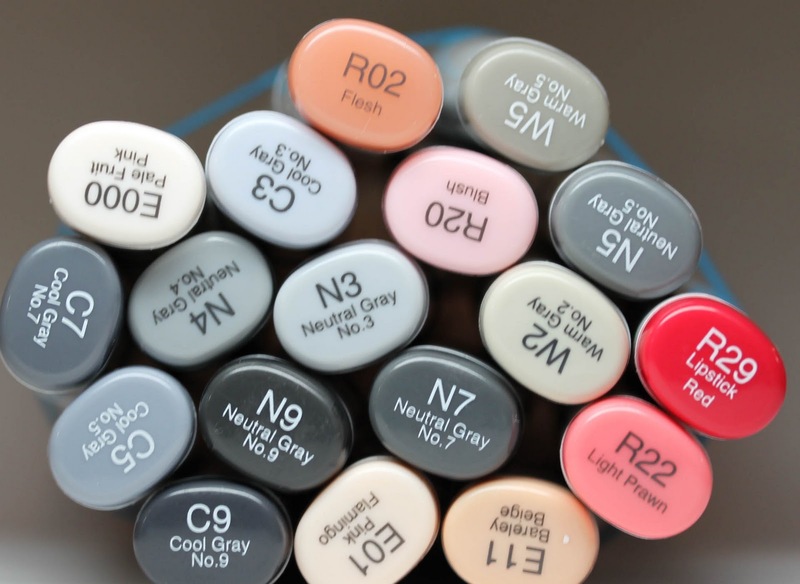 I colored my gal with the following Copic Markers: E47, E44, E02, E00 BG49, BG45, B00, R35, R32. I fussy cut her out leaving myself a *snowbank* at the bottom of the image. For the background, I embossed my background panel with an Embossing Folder and then distressed it with some Tim Holtz Snowcap Acrylic Paint. 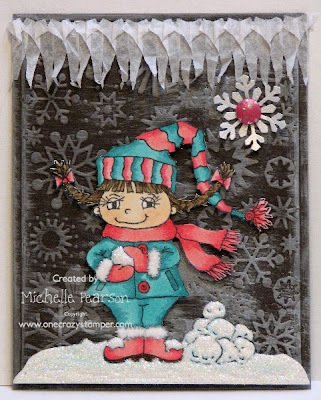 For a funky frosty look I did the whole card...the mat too! I added some glitter to the snow banks and snow balls. I added flocking to the coat cuffs and boots. The icicles on the card are HoneyComb paper scraps that I stretched out and taped down. Be sure to check out all of the new goodies Lora's been busy adding to the store and sales galore! It is definitely cold here today. All we need now is some snow -- not too much; just enough to give a winter wonderland effect for Christmas which is two weeks from today. 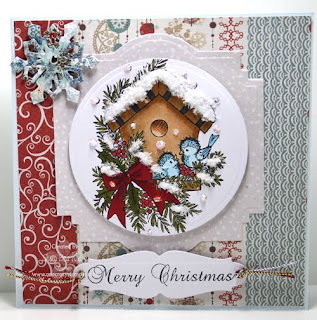 For my post today I have used this cute image designed by Tina Wenke for Stampavie called Winter Birdhouse. Check out Lora's store for the amazing Winter Clearance Saleand don't forget to share your Christmas/Holiday cards in our monthly challenge! Get all the details on the prize info and enter your card here. Hope you are staying warm as the cold weather is coming in! I will keep this short and sweet today because I am sure everyone is super busy with holiday preparations! I used the adorable Willow with a cocktail! She was super fun to color and she inked up so clean and it was such a nice impression. I was really impressed with that! Some stamps I have to stamp a few times to get a perfect impression and this one was the first shot! I used some design paper from my minds eye and I kept this really clean. I did not add a sentiment yet because I am not sure what I might use this for in the future. Of course she was colored with my copics! It is so easy to create a card when you coordinate products. 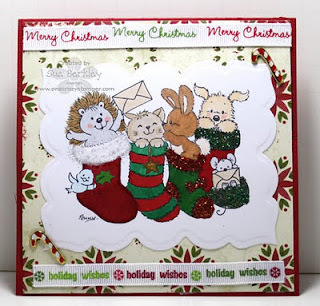 Today I have used My Mind's Eye 12 Days of Christams designer paper along with the 12 Days of Christmas rhinestones to make this adorable card. Welcome to my first Thursday post! Jacilynn & I will be sharing Thursday's each month with you. For this week's post I have gone with our Winter Theme because it's just that time of year. I have created 3 cards using the Elf Bell Mouse from Whimsy...I sooo love this little guy. Card # 2 is up on my personal blog HERE & #3 will appear tomorrow. Misc. 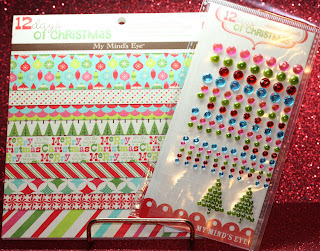 Supplies - Patterned paper is Fancy Pants "Winterland", cardstock is Bazzil 2 Scoops "Sprinkles" & Bazzil textured "Navajo". I used Harmonie ribbon & brads for my embellies. More stuff...Whimsy Winter Notables 1 with the Elegant Die, Ultra Fine White Flower Soft, Spellbinders Lacey Oval, Memento Tuxedo Black for stamping on Xpress It & Jenni Bowlin Chili Powder for the sentiment. 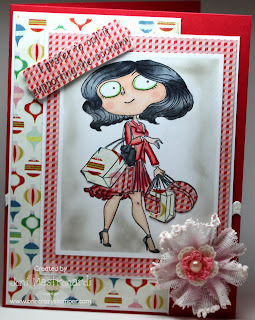 KK & OCS Blog Hop Winners!!! !